Advanced Home Warranty provide service nationwide and has a dedicated customer service professional to deal personally with each claim. Best for those looking to enhance the sale value of their home by including a home warranty with the purchase. The limits of liability are clearly published on their website. 13 months coverage for the price of 12. Advanced Home Warranty clearly spells out the limits of liability on its website. A quote is quick and easy to obtain. 24/7, dedicated toll-free customer service line. Additional coverage is available for items not included in the general plans. Advanced Home Warranty is not yet listed with the Better Business Bureau. Advanced Home Warranty is not liable for any of the work performed by the contractors. Advanced Home Warranty clearly spells out its limits of liability on its website which is a good starting point. Additional policy details are only available once you have requested a quote - but they are clearly set out. It is a relatively new company and as a consequence there is very little independent information available. 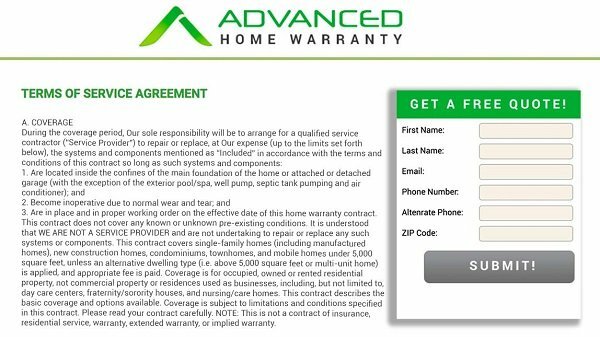 Advanced Home Warranty provides two plans; ‘Basic’ and ‘Total’. Unlike many companies which provide one plan for appliances and another plan for systems, Advanced Home Warranty plans cover a mixture of appliances and systems. ‘Basic’ covers the majority of the appliances and systems in your home from the heating and the microwave (built-in) to the electrical system and the garage door opener. ’Total’ includes all of the elements in ‘Basic’ but also includes air conditioning, your washer, dryer and refrigerator. You can also add optional extras such as central vacuum or septic tank. Basic Plan: covers a wide range of appliances and systems in your home, from the heating, electrical and plumbing systems to the dishwasher, built-in microwave and garage door opener. Total Plan: complete protection for your air conditioning system, refrigerator, clothes washer and clothes dryer. Advanced Home Warranty terms & conditions are aligned with the industry averages. Coverage starts 30 days after your payment is received and if you cancel your warranty refunds are made dependent on how long you have held your warranty. As with most companies you are required to keep records to show your appliances & systems have been maintained and may be asked for these in the event of a claim. Full limits of liability are published on their website and are no different from the limits of liability of most other companies. Your home will not be covered if you run a business, such as a home daycare from it. 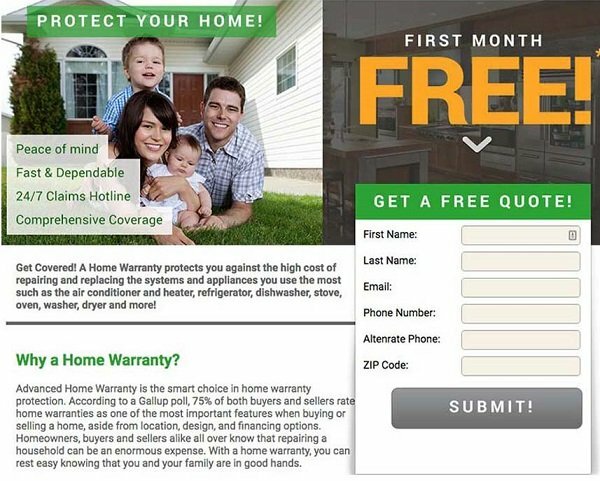 You can contact Advanced Home Warranty at any time on its 24/7 toll free customer service line. In the event of a claim you will be allocated a dedicated customer service representative who will assist you throughout the process. Contractors will be contacted within 2 days (4 days on weekends and holidays) unless the company considers it an emergency. In those cases contractors will be contacted as soon as possible. Approved contractors will be contacted by Advanced Home Warranty and the contractor will then contact you to arrange a mutually convenient time (during business hours) to visit. If a suitable contractor cannot be found you may arrange your own contractor and Advanced Home Warranty will reimburse you. Service calls are $60 per service item and you are required to pay this to the contractor, at the time of the call. This fee will be payable if you cancel at the last moment when the contractor is on their way to your home. As a new company, Advanced Home Warranty has few customer reviews around the web. For this reason the quality of customer service and contractor repairs is difficult to assess but the terms and conditions and limits of liability detailed show it to be very similar to other Home Warranty companies offering the same service. Advanced Home Warranty is a relative newcomer to the Home Warranty market place and is using its 24/7 customer service & dedicated staff to set it apart from other service providers.